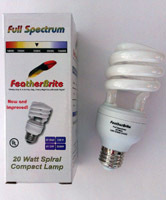 FeatherBrite full-spectrum light products revolve around a very special source of light. The FeatherBrite bulb emits light that is very close to that of natural sunlight. Sunlight and artificial sources of light are measured by color temperature and rendering. If you were to consider the intensity of the sun at noon daylight, it is about 5500 degrees Kelvin (K). Natural light not only provides warmth, but brings out the intensity of colors in a way that artificial fluorescent lighting rarely mimics. The FeatherBrite full spectrum bulb emits the same color temperature as the sun at high noon. Natural daylight is also measured at a color rendering index (CRI)of 100, which shows the vibrancy and intensity of colors in and around our environment. The FeatherBrite bulbs have a CRI of 91, and will bring out colors in your bird's feathers that you may not have even known existed while using a standard fluorescent cage light. Full spectrum fluorescent light emits light in all parts of the visual spectrum and some in the ultraviolet range (short-wavelength, high-energy light). To be a full spectrum bulb, the color temperature must be 5000K or greater and the CRI must be at least 90. A standard fluorescent bulb generally only has a CRI of between 60 and 75, which means the intensity of the source of light is much lower, the temperature is cooler, and there is a noticeable difference or dulling of colors when objects are placed under a standard bulb. Keeping to those standards, the FeatherBrite bulb comes quite close to being a source of natural light for your bird and the differences, not just visually, but in the demeanor and general health of your bird are vast. The FeatherBrite bulbs will fit any standard socket. Our Moonlight bulb has a candelabra socket but included is an adapter that will fit standard sockets. Both our full spectrum bulbs and our LED moonlight bulb are guaranteed for 1 year. Because these bulbs have an electronic ballast, any type of dimmer switch cannot be used. Doing so will void any warranty of the bulb.